Guangzhou, whose former name is Canton, is one of the three largest cities in China. It is the capital of Guangdong province located in the west of China. The city is located about 120 kilometres from Hong Kong, on the Pearl River. The city, which was founded in 214 BC, has been a hotspot for cultural exchange, trading, and reforms/revolutions for several years, which in turn makes it a popular stopover for anyone who is willing to dig into Chinese culture and history. The city experiences a humid subtropical climate despite being the southern part of the Tropic of Cancer. The East Asian monsoon often influences this weather. Winters in the city are mildly dry while summers are characterized by a high heat index, high humidity, and hot temperatures. It also has a long monsoon season, which often runs from April till September. Temperatures average at around 13.6 degrees in January and 28.6 degrees in July. The annual mean for temperatures is estimated at 22.6 degrees Celsius. The city last experienced snowfall nearly 87 years ago. The city is considered the largest business hub in the pearl river delta. It is also the leading manufacturing and commercial region. The GDP of Guangzhou was estimated at 1,542 billion Yen in 2013, with a per capita GDP of 19,459 $. It is considered one of the wealthiest cities in the country. Unfortunately, due to the rapid industrialization, it also ranks among the most polluted cities in China. Guangzhou is home to the Canton Fair, which was formerly known as the China Import and Export Fair. The event is held every year in April and October and is hosted by the ministry of trade. Since its inception in 1957, the fair has remained a major event for the city. Today, it takes place in the Guangzhou International Convention and Exhibition Centre. Guangzhou attracts more than hundred million visitors each year thanks to its many tourist attractions. The most famous are known as the “Eight Views of Ram City”. The list of attractions that are included under this umbrella term keeps changing. As at the last appraisal held in 2011, the eight were listed as: The Pearl River Flowing and Shining, Wetlands Singing at Night, Towers Shining through the New Town, Yuexiu Grandeur, Science City, Cloudy Mountain Green and Tidy and the Liwan’s wonderful scenery. The district boarders Tianhe district to the west and Liwan district to the right. It is considered the cultural, political and commercial centre of Guangdong. The district is most famous for its high quality in education. The provincial government of Guangdong and the city government of Guangzhou are both located in the district. Yuexiu was established in 1960, absorbing the former Dongshan district alongside several other former districts like Tianhe and Baiyun. 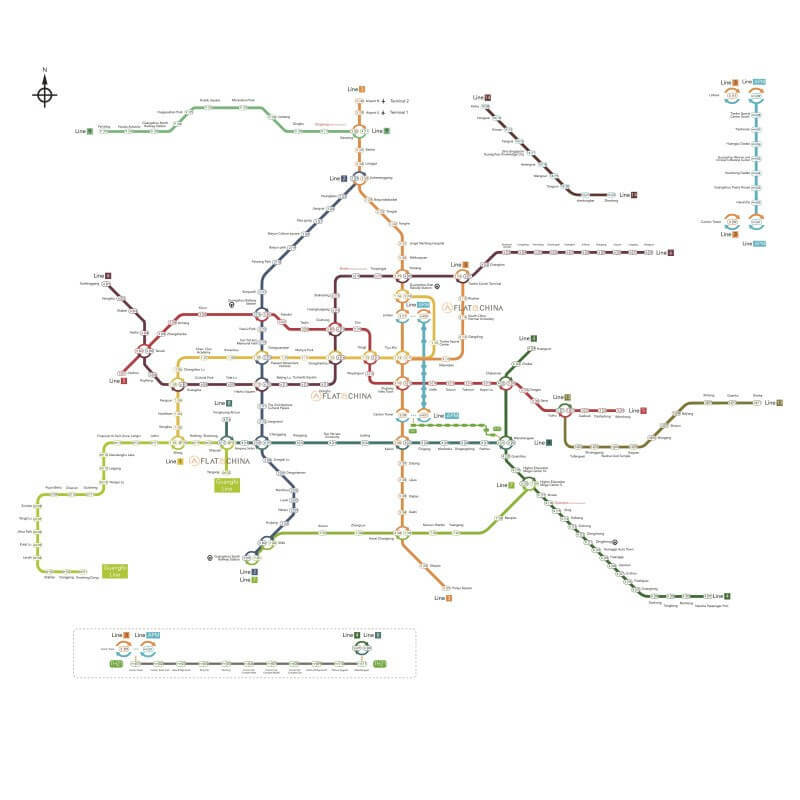 Main subway stations are: Gongyuanqian, Martyrs’ Park and Haizhu Square. The name of the district was derived from the word ‘Lizhiwan’, which comes from a poem about ‘a bay of green water and red lychees.’ The district covers an area of approximately 6.9 square meters. Its population is estimated at 540,000 for natives and 200,000 for non-natives. Liwan city is home to tourist attractions such as the Lizhiwan lake Park, Xiguan Old Houses, and Shamian Island. Main subway stations are: Chen Clan Academy, Zhongshanba and Huangsha. This is the business district of Guangzhou, characterized by tall buildings and shopping malls. It also hosts Shipai, the old messy urban village. Many expat communities are also found within this district. It also serves as the transportation hub for trains going to Hong Kong. Tourist attractions include Central Library, Shipai Village, Opera House and the Guangdong Museum. Main subway stations are: Tianhe Sports Center, Tianhenan and Tiyu Xilu.